Herman Frazier and June Jones hold up the WAC trophy after Hawaii's win over Boise State at Aloha Stadium to clinch the league championship. As head of the school, University of Hawaii President David McClain stepped forward to acknowledge ultimate responsibility for the outcome of negotiations with June Jones in the wake of the now former Hawaii football coach's departure to Texas. After a flurry of 11th-hour negotiations and appeals from the state, ranging from fans to Gov. Linda Lingle, Jones decided yesterday morning to end his nine-year run at Hawaii in favor of accepting the head coaching job at Southern Methodist. But McClain said the effort to keep Jones in Manoa should not have come down to a 2-minute drill. A statement made at a hastily assembled press conference yesterday afternoon at Hawaii Hall included an apology from McClain as he and UH-Manoa Chancellor Virginia Hinshaw responded to Jones' decision to take over the floundering Mustangs' program after leading UH to unprecedented heights this season. "I want to apologize to our fans and to the state for matters getting to this stage in the first place," McClain said in his prepared statement. "Exceptional performance deserves exceptional recognition, and your university was slow to step up. That won't happen again." The Sugar Bowl, played a week ago today, marked the last game covered under a five-year contract Jones signed in summer 2003. The pact was to officially expire on June 30. Negotiations were being handled by athletic director Herman Frazier, who did not attend yesterday's press conference and is expected to be out of his job today. McClain said his understanding of the situation was that some "minor discussions" regarding Jones' contract had taken place in August but were shelved once Jones became immersed in what would become a historic 12-1 season. He acknowledged he could have gotten involved earlier in the process, but added that Jones' contract situation could have been addressed long before it became a pressing issue. "If you look at the tradition for high-performance coaches throughout the country that are on, say, five-year agreements, it's pretty normal to talk about an extension after three or four," McClain said. "In that regard we should have been on the case a bit sooner. If we were on the case, we certainly didn't get to the point where anything got forwarded to me." With SMU making its push for Jones following the Sugar Bowl, McClain entered into the process, and UH countered with an offer of $1.5 million. Jones seemed to waver late Sunday but decided to take the SMU job. "I felt it appropriate for where we were at," he said of his involvement. "I thought I could make a difference, almost did." 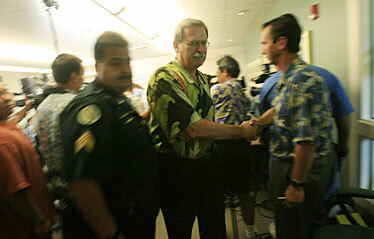 University of Hawaii President David McClain exited a press conference at Hawaii Hall on the University of Hawaii-Manoa campus yesterday after discussing the departure of Warriors football coach June Jones. Hinshaw said the school also addressed Jones' concerns over, among other, renovations at the football offices, improvements to the locker room and facilities overall, and the recruiting budget. "We were pleased that Coach Jones' agent himself, Leigh Steinberg, felt that these answered a number of the coach's concerns," Hinshaw said. "In the end, however, Coach Jones informed us that his decision to accept the SMU position was based on his desire to undertake a new challenge and a new beginning at this stage of his life. "He's a builder and he enjoys building programs like he's done here," she added. "So we have to wish him well in that regard." At the press conference announcing his hiring in Dallas yesterday morning, Jones said his attachment to Hawaii made for a difficult decision. "It was a very, very difficult decision because of that, my relationship with not just the school, but with the people of Hawaii," he said. "But the opportunity here surpasses everything. There's a time to move on, and I just really believe this is the time for me to move on. The opportunity for my family to take a step and have this happen is more than anything I could imagine." McClain and Hinshaw said the search for a new coach would begin immediately, with an eye on the Feb. 6 start of the signing period for incoming recruits. McClain said more details on the search process would be revealed after today's press conference regarding Frazier's situation. Union rules call for a job to be posted for 10 days, but McClain said there is a possibility that period could be cut in half. "I don't want to speculate on a precise date (to name a new coach), but obviously we're on the case and we're in a challenging situation," McClain said. "We know when the recruiting deadlines are." For his part, Jones said he has commitments from several members of the current coaching staff to join him at SMU and said he will be setting up in Dallas soon. "I think Hawaii, if they make the right decisions, I feel comfortable that they're going to continue to win," Jones said. "There's a lot of good young football players on that team."